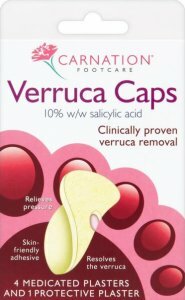 CarnationVerruca Care - When verrucas are painful, use all-in-one Carnation Verruca Care to treat the verruca and pad the pain. A course of treatment consists of four medicated plasters changed every two days and a final protective plaster which should be kept in place for as long as possible. No more than 3 verrucas to be treated at one time. If the verruca has not disappeared after 4 weeks treatment can be repeated. Chidlren under 6 or adults over 50 should seek medical advice before use to ensure the condition is a verruca. While using Verruca Care apply no other medicated product to your verruca and do not use Verruca Care for any other purpose. Do not use product after expiry date shown.